Danish-born German draughtsman and painter. Apart from some initial training at the Copenhagen Academy he was largely self-educated. 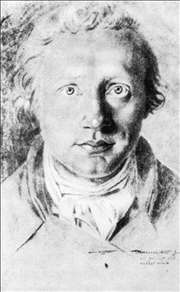 He moved to Berlin in 1787 and taught at the Academy. After 1792 he lived in Rome with the help of a grant from the Prussian State. Carstens was totally committed to Neoclassicism and concentrated on heroic figure compositions. He was uninterested in colour and was much more prolific as a draughtsman than as a painter. His work has a pompous seriousness in tune with his own inflated idea of his genius, but he is a significant figure because of the strictness of his ideals and the influence he had on the next generation of artists, notably Thorvaldsen and the Nazarenes. He was appointed professor at Berlin, and in 1795 a great exhibition of his works was held in Rome, where he died in 1798. Carstens ranks as the founder of the later school of German historical painting.